NASA’s planned Mars 2020 rover likely will both continue the astrobiological exploration of Mars begun by the Curiosity rover and provide stepping stones to the next stages of Martian exploration. Two weeks ago, NASA’s Mars 2020 rover Science Definition Team (SDT) delivered its report recommending the science goals for the mission. Probably to the surprise of no one, the team recommended essentially the same science goals as had several previous SDT’s on what NASA’s next mission to Mars should do. Like the Curiosity rover currently on Mars and the planned European and Russian ExoMars rover mission, the 2020 rover will look for clues as to whether Mars ever contained the conditions to enable life and whether traces of life or pre-biotic chemistry remain. The mission will also provide an important transition to the next phases of Mars exploration by caching samples that could eventually be returned to Earth and testing technologies for future human and robotic missions. The challenge the SDT faced was how to do all of this on a budget (~$1.5B) that with inflation may be just somewhat more than the half cost of the initial Curiosity rover. To fit within the budget, a key tradeoff would have to be made that will make the 2020 rover less capable in a key respect than the Curiosity and ExoMars rovers. The 2020 rover will be enabled by the substantial investment NASA made in the design of the Curiosity rover and its entry, descent, and landing system. NASA and the Jet Propulsion Laboratory that built the Curiosity rover also retain substantial stockpiles of spare parts and engineering expertise that can be used in rebuilding substantial portions of the spacecraft. 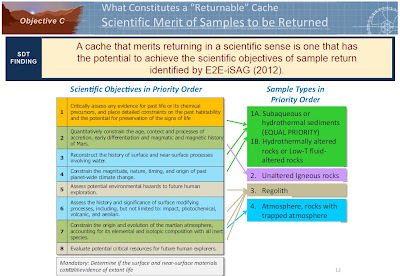 I’ve read many press summaries of the SDT’s recommendations, which tend to focus on the proposed caching of samples for possible return to Earth. If NASA follows through, this will be the first concrete step towards a goal that Mars scientists have made their top priority for decades. However, the caching is just one aspect of the proposed mission. Double click on any image for a larger view. To understand the full promise of this mission, I’ll go through each of the SDT’s proposed goals for the mission (which closely parallel those NASA asked the SDT to consider). First, though, the proposed mission implementation to meet those goals makes more sense with some background on how rovers are used as scientific platforms. In the course of driving several kilometers, a rover will pass by thousands of potential spots for more detailed examination. Each of those examinations, though, can take days to weeks complete. There is a tradeoff between driving distance, and hence number of locales that can be explored and the number of spots where in-depth data can be gathered. Rovers on Mars follow a hierarchical strategy for selecting a small number of targets for in-depth exploration. The SDT described their proposal for the 2020 mission in terms of fulfilling four goals, and I’ll present their recommendations for each of those four goals. The 2020 rover would follow a hierarchical strategy to explore a location on Mars believed to have been habitable. The definitive identification of past signs of life is likely to require the testing of returned samples in Earth laboratories. Every NASA landed Mars mission – except the 1996 Pathfinder mission that focused on technology demonstration – has had the goal of exploring Mars’ past and current potential for life or pre-biotic chemistry. For the MER rovers, the goal was simply to determine whether water – an essential ingredient for life – was present at the surface early in Mars’ history. The Curiosity rover is exploring Gale Crater to examine soils from many eras of Martian history to determine whether or not environments for life existed and to determine whether biosignatures of past life remain. The 2018 ExoMars rover will explore another site on Mars for its astrobiology potential. 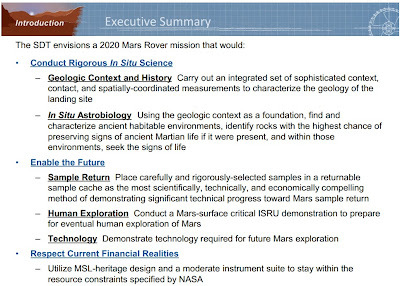 The SDT has proposed that the 2020 rover continue the strategy and pursue astrobiology as the mission’s defining goal. Its proposed strategy breaks into two parts. The first is to have the rover carry a suite of instruments capable of a exploring site’s geologic history in-depth with an emphasis on how that history affected the possible presence of past life. The team proposes that the rover carry multispectral cameras for obtaining images and an imaging spectrometer for analyzing composition across entire sites. These instruments would provide the context to interpreting each locale’s history as well as allowing the science team to select specific targets for more detailed exploration. For most of the contact science, the SDT is proposing that the rover carry a new generation of instruments. Current Mars rover contact spectrometers measure mean composition over an approximately two centimeter contact area. The new generation of instruments under development can make composition measurements for spots as small as a tenth of a millimeter. With that resolution, the contact spectrometers would make dozens to hundreds of measurements across the contact area. The remote sensing and contact instruments listed above are included in the baseline recommendations and are expected to be affordable at the low end of the expected budget (~$90M to $125M) for the science instruments. If the budget becomes plusher, the SDT recommends two additional instruments to study the shallow subsurface beneath the rover. A ground penetrating radar would detect subsurface rock and soil layers, providing better context for understanding the geology exposed at the surface. A gamma ray spectrometer would measure the composition of soil in the upper few centimeters and could alert scientists to interesting substances just below the upper veneer of soil. A capable instrument suite enables scientific exploration; the rover still must be delivered to a location that orbital instruments show might have been a location for life or pre-biotic chemistry. A number of such locations are known, and more are being searched for. However, these sites often lie within rough terrains with just a small area free of large rocks that would end the mission should the rover be unlucky enough to land on one. The 2020 rover mission will inherit the precision landing system developed for the Curiosity rover that reduced the area of the landing ellipse to a fraction of what it had been for previous landers. The SDT recommends shrinking that ellipse further to allow more landing sites to be considered. On past missions, the parachute has opened at the earliest possible time during the descent. For the 2020 descent, the SDT recommends that the entry system have the ability to vary the time of opening based on its estimate of its position relative to the landing zone. This relatively simple enhancement could reduce the size of the landing ellipse by 25% to 50%. Many potentially interesting astrobiology sites on Mars lack any area the size of a landing ellipse free of large rocks or dangerously steep slopes. A second enhancement the SDT asked NASA to consider is terrain recognition navigation (TRN) that would enable the lander to compare images of the landing area stored on board with real-time images taken during the descent. This capability would allow the descent system to determine its actual location and steer free of hazardous terrain in the moments of final descent. 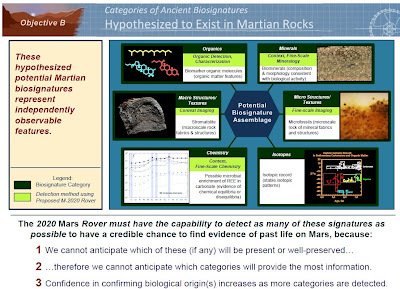 Examples of potential biosignatures and measurements the 2020 rover could make to find them. Much of the scientific attraction of Mars comes from its preservation of ancient surfaces and rocks that might retain records of conditions that could have led to life or even records past life itself. 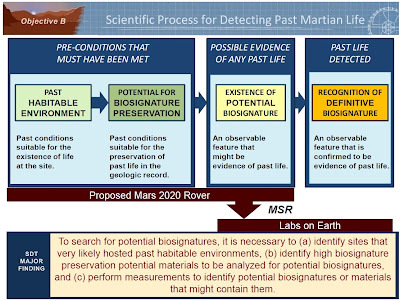 The second proposed goal for the 2020 mission would have the rover actively assess whether biosignatures could have been preserved and to search for those biosignatures. What would be a biosignature? If we were extremely lucky, it might be fossilized layers from algae-like micro-organisms visible to the cameras. More likely, it would be the alteration of rock or soil chemistry in a way that would be best explained by complex organic chemistry or the actions of life. Again, if we were lucky, it could be the presence of organic matter preserved for billions of years. The rover would seek biosignatures using all of the instruments listed above and with one or two instruments that would be selected for their ability to detect organic material. The Viking and Phoenix landers and the Curiosity rover (and the future ExoMars rover) have relied on sophisticated analytical instruments such as mass spectrometers to detect organic molecules. These instruments are capable of much more sophisticated measurements than is possible with contact instruments that must operate directly in the harsh Martian environment. Analytical instruments have soil samples delivered to them where they can be analyzed with numerous techniques and altered through heating or wetting to release gasses or induce chemical reactions. Unfortunately, the budget for the 2020 rover does not include funding for analytical instruments. Instead, the SDT proposes that the rover carry one or two spectrometers capable of detecting the presence organic matter. 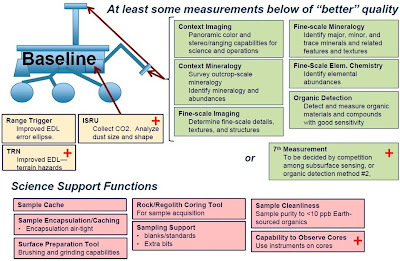 The authors of the SDT report are clear that the strategy they propose will result in the 2020 rover having significantly less capabilities to analyze potential organic material than other missions with analytical instruments. The SDT points out a compensating new capability for the 2020 rover: sample caching. As described below, if the cache is eventually returned to Earth, terrestrial laboratories could perform far more sophisticated measurements than would ever be possible on a rover or lander. Priorities for samples to be collected. 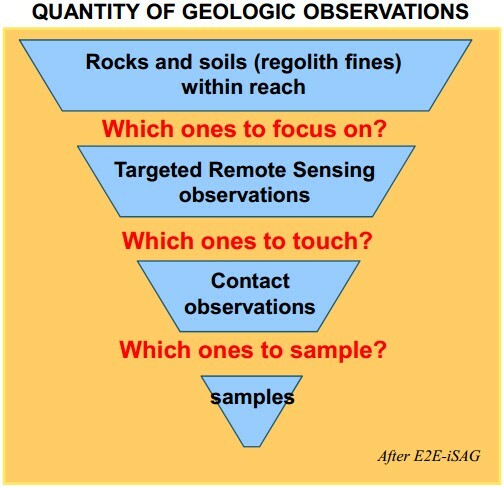 The E2E-iSAG was a previous mission assessment for a rover mission focused on selecting and caching samples. Returning a carefully selected set of Martian samples has long been a goal of the Mars science community. The last planetary Decadal Survey ranked a mission to select and cache a set of samples for future return to Earth as its highest priority large mission for the coming decade. A follow on mission would collect the samples and take them into Martian orbit, and a third mission would retrieve the samples from that orbit and bring them back to Earth. The President’s Office of Management and Budget balked at beginning a sequence of missions that in combination could cost $6B to $8B. They agreed to the 2020 rover mission to continue the in situ exploration of Mars and to demonstrate technical progress towards future robotic and manned missions, including caching samples. The SDT concluded that the difference between demonstrating the technical capability to select and cache samples and actually leaving a returnable cache would be minimal. They recommend the rover assemble a sample cache of up to 31 to 38 five centimeter long core samples of rock and soil acquired by the rovers drill. Once collected, the cache would be placed on the surface for a future mission to collect in a few years or even a few decades. Better instrument the entry and descent system to collect information on the conditions of descent and parachute performance. (The Curiosity entry and descent system collected extensive information during its landing; the proposed 2020 system would collect that information and new information.) The technologies discussed earlier to reduce the risk of landing by timing the parachute opening and using terrain recognition would also benefit future missions. Collect extensive weather information including atmospheric temperature profiles and atmospheric dust profiles to better understand atmospheric behavior. Collecting this information would better characterize the atmosphere and reduce risk for future landings on Mars. Capabilities of the 2020 rover proposed by the SDT. Boxes without ‘+’ represent the recommended threshold capabilities below which the mission might not deliver sufficient value for the investment. Boxes with ‘+’ represent highest priority additions beyond the threshold capabilities. If more funding than the SDT were available, the mission could be further enhanced with either more capable instruments or additional instruments such as a weather station or additional instruments to characterize any organic matter. The mission proposed by the SDT would meet the goals set out for a caching rover as the top priority in the last Decadal Survey. It would also meet the goals recently set out by NASA for demonstrating key technologies for future missions. At the same time, even if the samples not collected, the rover would carry out intensive geological and astrobiological exploration at a fifth site on Mars. (The Viking landers explored two sites in the 1970s, the Phoenix lander explored the ice-rich northern plains, the Curiosity rover is exploring Gale Crater now, and the ExoMars rover will presumably explore yet another site.) The new generation of contact instruments that will be ready for the 2020 rover will allow exploration of the composition of Martian soils and rocks at micro-scales that previous missions have not be able to do. This is an exciting new capability. While the SDT report doesn’t spend much time on the possible weather station that the 2020 rover may carry, I think this would be an important addition. Scientists have long wanted to get a network of metrological stations on Mars to better explore weather patterns. In 2020, there may still be three functioning weather stations already on Mars: Curiosity, NASA’s InSight lander, and the Russian surface station planned for the ExoMars mission. A fourth station would be an important addition. The 2020 rover is a mission that will be done on a tight budget. The highly capable analytical laboratories of the Viking and Phoenix landers and the Curiosity and ExoMars rovers would not fly on the 2020 rover. The capabilities the SDT recommends for the 2020 rover meet all the requirements previous SDT’s have laid out for a rover mission focused on sample selection and caching. However, the 2020 rover would have less capability for science on Mars for characterizing organic matter and other volatiles than Curiosity or the ExoMars rover. Of course, the need for the analytical laboratory would go away if the sample cache is returned to Earth laboratories. The 2020 rover would make the investment in the first crucial step, selection and caching of samples, of the Holy Grail of Mars science: returning samples. How long might those samples sit on the surface of Mars before being collected? I expect that that will be a question for how compelling the discoveries by the rover’s instruments are and the generosity of future governments. And it may not be American craft or only American craft that collect and return the samples. In the coming two decades, several space agencies are likely to have the technology to participate in the sample return. A second bet being made is to leave out a deep drill such as the ExoMars rover will carry. The drill proposed for the 2020 rover will collect samples five centimeters (about two inches) in length, similar to that carried by the Curiosity rover. This may not be deep enough to get below the surface radiation that is believed to destroy organic matter at Mars (see this post). The ExoMars drill was designed with this problem in mind and will reach up to two meters below the surface. Adding a similar drill to the 2020 rover would require a substantial modification to the Curiosity rover design isn’t possible within the budget. However, if the Curiosity rover doesn’t find organic matter and the ExoMars rover does but deeper beneath the surface, then the bet on the shorter drill will look problematic. Even with the current budget realities, though, the SDT has proposed a highly capable, exciting mission. NASA’s officials warmly received the recommendations, indicating that their final choices for the mission are likely to be similar to those recommended by the SDT, but some changes are possible. A key decision by NASA will be on whether to fund the sample collection and caching system and the sophistication of that system. Current news reports indicate that it intends to fly this system. The next step for the mission will be for NASA to issue a call to solicit instrument proposals this coming fall. The type of instruments NASA says it is interested in receiving proposals for is likely to be the definitive statement on the mission’s scientific goals. For more information on the SDT’s recommendations you can read these documents. Long time readers of this blog know that in the past, I frequently wrote to give updates on the progress of NASA’s budget as it moved through Congress to final approval. Before this year, no one else was providing this kind of coverage focused on the planetary program. Now Casey Drier at the Planetary Society regularly posts updates, and I recommend that you add the Society’s blogs to your regular reading. This will free up more time for me to write longer stories about potential and planned missions such as the one I did recently on Uranus. (When I started this blog, I was getting my PhD, and had one dissertation-quality research project. Now I’m doing three to four.) I will still write in-depth analyses of NASA’s budget (and other space agencies when I can find detailed information), but will wait for major milestones. The proposed House budget would also reduce NASA’s overall budget to $16.6B, a figure that was last seen in 1986. (Casey has a nice graphic in his post.) If you go to one of the inflation calculators available on the web, you’ll find out that there’s been 112% inflation since 1986. A simple consumer inflation index, however, doesn’t fully capture the change in costs for NASA. The march of technology will have reduced the costs of many items and activities since 1986, but other costs such as maintaining buildings and making payroll probably will have increased close at a rate close to the consumer price index. Regardless of how this proposed budget compares to 1986, it would be another in a series of cuts to NASA over the last several years. This year the two houses of Congress (each controlled by a different political party) seem further apart than ever in their views of what the Federal budget should be. I expect many twists and turns, which you can follow on Casey’s blog. When major events occur, I will do my traditional in-depth analyses. NASA today announced the goals for its planned Mars 2020 rover mission. The mission will be based on the Curiosity rover and its entry, descent, and landing design. Explore an astrobiologically relevant ancient environment on Mars to decipher its geological processes and history, including the assessment of past habitability. Assess the biosignature preservation potential within the selected geological environment and search for potential biosignatures. Support technology demonstrations and weather measurements that will contribute towards a possible future human mission. I'll read through the Science Definition Team's report this week and provide a more detailed analysis later this week. WASHINGTON -- The rover NASA will send to Mars in 2020 should look for signs of past life, collect samples for possible future return to Earth, and demonstrate technology for future human exploration of the Red Planet, according to a report provided to the agency. The 154-page document was prepared by the Mars 2020 Science Definition Team, which NASA appointed in January to outline scientific objectives for the mission. The team, composed of 19 scientists and engineers from universities and research organizations, proposed a mission concept that could accomplish several high-priority planetary science goals and be a major step in meeting President Obama's challenge to send humans to Mars in the 2030s. "Crafting the science and exploration goals is a crucial milestone in preparing for our next major Mars mission," said John Grunsfeld, NASA's associate administrator for science in Washington. "The objectives determined by NASA with the input from this team will become the basis later this year for soliciting proposals to provide instruments to be part of the science payload on this exciting step in Mars exploration." NASA will conduct an open competition for the payload and science instruments. They will be placed on a rover similar to Curiosity, which landed on Mars almost a year ago. Using Curiosity's design will help minimize mission costs and risks and deliver a rover that can accomplish the mission objectives. The 2020 mission proposed by the Science Definition Team would build upon the accomplishments of Curiosity and other Mars missions. The Spirit and Opportunity rovers, along with several orbiters, found evidence Mars has a watery history. Curiosity recently confirmed that past environmental conditions on Mars could have supported living microbes. According to the Science Definition Team, looking for signs of past life is the next logical step. 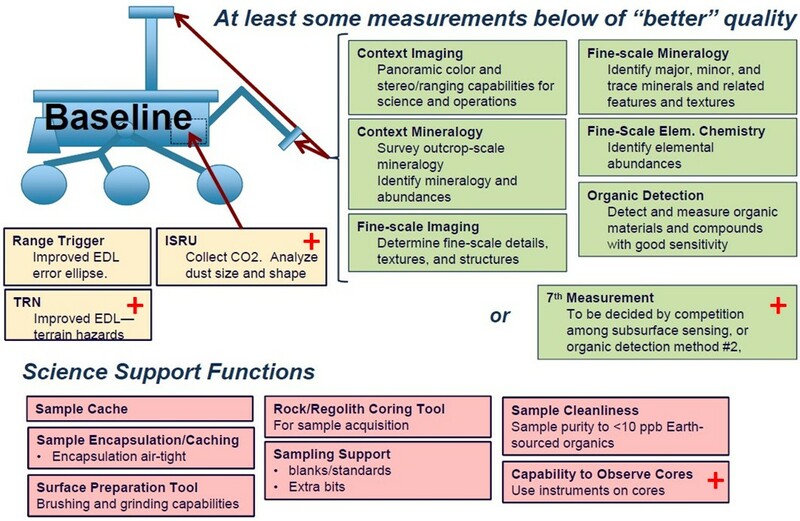 The team's report details how the rover would use its instruments for visual, mineralogical and chemical analysis down to microscopic scale to understand the environment around its landing site and identify biosignatures, or features in the rocks and soil that could have been formed biologically. "The Mars 2020 mission concept does not presume that life ever existed on Mars," said Jack Mustard, chairman of the Science Definition Team and a professor at the Geological Sciences at Brown University in Providence, R.I. "However, given the recent Curiosity findings, past Martian life seems possible, and we should begin the difficult endeavor of seeking the signs of life. No matter what we learn, we would make significant progress in understanding the circumstances of early life existing on Earth and the possibilities of extraterrestrial life." The measurements needed to explore a site on Mars to interpret ancient habitability and the potential for preserved biosignatures are identical to those needed to select and cache samples for future return to Earth. The Science Definition Team is proposing the rover collect and package as many as 31 samples of rock cores and soil for a later mission to bring back for more definitive analysis in laboratories on Earth. The science conducted by the rover's instruments would expand our knowledge of Mars and provide the context needed to make wise decisions about whether to return the samples to Earth. "The Mars 2020 mission will provide a unique capability to address the major questions of habitability and life in the solar system," said Jim Green, director of NASA's Planetary Science Division in Washington. "This mission represents a major step towards creating high-value sampling and interrogation methods, as part of a broader strategy for sample returns by planetary missions." Samples collected and analyzed by the rover will help inform future human exploration missions to Mars. The rover could make measurements and technology demonstrations to help designers of a human expedition understand any hazards posed by Martian dust and demonstrate how to collect carbon dioxide, which could be a resource for making oxygen and rocket fuel. Improved precision landing technology that enhances the scientific value of robotic missions also will be critical for eventual human exploration on the surface. 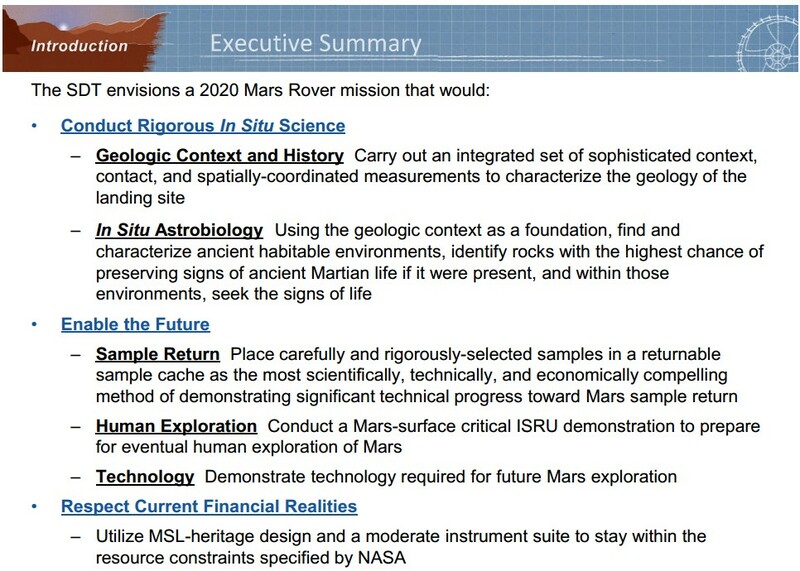 The complete Science Definition Team report is available online at: http://mars.jpl.nasa.gov/m2020/ . For more information about NASA's Mars programs, visit: http://www.nasa.gov/mars . Why the interest now? First, the 2011 Decadal Survey ranked a $2B Uranus orbiter and probe mission as a priority to launch in the coming decade. (Alas, new budget realities make any such mission look 20 years away or more now.) Second, the Uranus-sized worlds are proving to be common in other solar systems and may be the most common type of planet in the galaxy. Our only up close examinations of planets in this class were the flybys of Uranus and Neptune in the 1980s by the Voyager 2 spacecraft that carried 1970s vintage instruments. Third, NASA’s development of the light and relatively cheap ASRG plutonium-based power systems enables cheaper missions than were possible with the older, heavier power systems. And fourth, the changing outer planet alignments have made gravity assists from Jupiter and Saturn to shorten flight times to Neptune impossible the current mission planning window. Jupiter is still available for Uranus missions in the coming decade. Voyager 2’s cameras saw a near featureless cloud deck at Uranus. More recent images from observatories looking in different portions of the spectrum have shown that Uranus has an atmospheric circulation system as complex as Jupiter’s or Saturn’s. 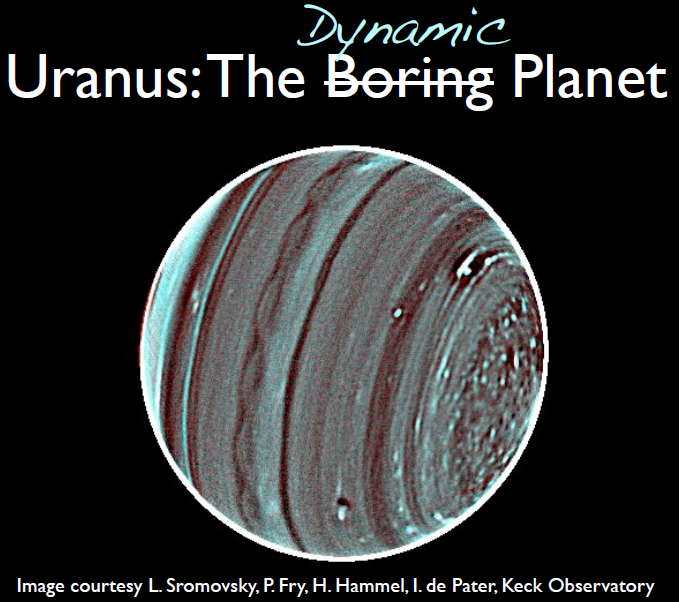 From a presentation on a Uranus atmospheric probe mission by Mark Marley and colleagues at NASA’s Ames Research Center. For Uranus, science objectives break into several broad classes of studies. Scientists want to send a probe into the atmosphere for detailed composition measurements of the atmosphere to better understand how Uranus formed and how its structure has evolved. Remote observations of Uranus to study its weather, understand its heat balance, and probe its interior are another priority. Researchers would like to study the planet’s ring system many and many moons up close. And finally, they would like to re-measure Uranus’ highly unusual magnetosphere which is unlike any other planet’s except for Neptune’s. The ideal mission architecture would combine an atmospheric probe with an orbiter, as proposed by the Decadal Survey. (You can find a copy of the mission study at this website.) The atmospheric probe would gather compositional information that is not available any other way. An orbiter would stay within the Uranus system for prolonged observations of the planet, rings, and moons. From orbit, the spacecraft would also traverse many locations within the magnetosphere allowing a study of its structure not possible from a flyby spacecraft that travels a single path. The scientific case for exploring Uranus is solid and gaining attention. NASA’s shrinking planetary science budget, however, can no longer support the approximately $1.8B orbiter and probe recommended in the Decadal Survey. Mission architects, however, have begun to look at alternative, cheaper missions that could fit in the New Frontiers (~$1B) and Discovery (~$500M) mission programs. These cheaper missions would reduce costs by conducting only a portion of the Uranus science goals. 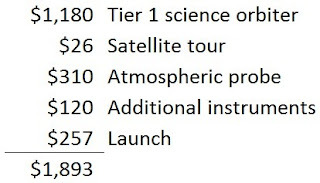 The team examining Uranus science goals for the Decadal Survey divided the science goals into Tier 1 (highest priority), Tier 2 (high priority), and Tier 3 (highly desirable). While the Decadal Survey endorsed a mission that would address goals from all three tiers, a New Frontiers mission would likely focus on only the highest priorities. Estimated costs of Uranus mission elements from the DecadalSurvey’s Ice Giants Decadal Study Mission Concept Study. 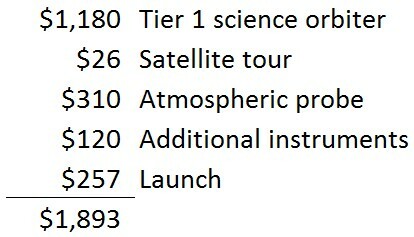 The Tier 1 (highest priority) science orbiter costs are near the cost of a New Frontiers mission. Many observers have commented that the Decadal Survey mission costs were conservative (i.e., erred on the high side) so a New Frontiers Uranus orbiter might fulfill all the Tier 1 goals. An orbiter would allow many regions of the Uranus system to be explored. This figure is from the mission concept study and shows the path of the orbiter in a Uranus-fixed coordinate system. If the spacecraft’s orbit were designed to enable close flybys of Uranus’ larger moons, these three instruments would also address two Tier Two science priority objectives: “Remote sensing observations of large satellites,” and, “detect induced magnetic fields that would be indicative of interior oceans [in Uranus’ moons].” However, the best orbits for meeting the Uranus observations are not the same as those for close flybys of the moons. Accomplishing both would require a longer and more expensive orbital tour (~$26M more) that might not fit within a New Frontiers budget. To my knowledge, no formal analysis of a New Frontiers class Uranus atmospheric probe mission has been performed. However, the requirements and complexity of such a mission would seem to be similar to that of a Saturn atmospheric probe mission. That mission has been studied and been judged to fit within a New Frontiers budget. (A Uranus mission would have a longer flight time that would raise costs somewhat compared to a Saturn mission.) Requirements for the atmospheric probe portion of a Uranus orbiter also were examined by as part of the Decadal Survey and continue to be studied at NASA’s Ames Research Center. “Determine the noble gas abundances (He, Ne, Ar, Kr, and Xe) and isotopic ratios of H, C, N, and O in the planet’s atmosphere and the atmospheric structure at the probe descent location.” Instruments: Mass spectrometer and pressure, temperature, and acceleration/deceleration sensors. Further analysis by the NASA Ames team suggests that the atmospheric probe should be able to survive to below the bottom of the methane clouds where the atmospheric pressure would be five times that at sea level on Earth. (Measurements from below the lower water clouds – a key goal for the Galileo atmospheric probe at Jupiter – also would be beneficial, but these are too deep and the pressure too great at Uranus to achieve within any mission currently conceived.) Uranus is believed to contain 30 to 50 times more carbon (a key element of methane) than would have been the mean in the solar nebula from which the planets formed. A key question for planetary science has been how the enrichment of carbon and other elements occurred. Measurements of the ratios of key elements and their isotopes would help determine whether Uranus-class planets are cores of planets that failed to grow into Jupiters or super-Jupiters or represent an entirely different path of planetary creation. The proposed Saturn atmospheric probe would be carried to its destination by a simple carrier craft that would also act as a data relay that would collect and return the atmospheric probe’s data to Earth. As envisioned by the Decadal Survey, the carrier craft would not carry any instruments of its own. A Uranus atmospheric probe carrier craft also probably would not carry any instruments. If the scientific community continues to support the same priorities as the team that examined Uranus mission goals for the Decadal Survey, the orbiter would address Tier 1 goals while the atmospheric probe mission would address Tier 2 goals. That would give the nod to the orbiter mission. There is one programmatic hitch to using the New Frontiers program for either a minimalistic orbiter or an atmospheric probe mission. New Frontiers missions are selected from a list of candidate missions pre-selected by the Decadal Survey. The current list includes missions to Venus, the moon, a comet, the Trojan asteroids, Io, and Saturn, but not Uranus. However, NASA can change the list and has suggested (see this presentation) that it would be open to a request by the planetary science community to change the list in light of the smaller budgets that have become reality since the Decadal Survey. There will also be a science community review of the Decadal Survey in the second half of this decade that will review the candidate list and could revise it. Either approach would add a Uranus mission to the list of candidates, but Uranus would be in competition with five to six other exciting destinations. The new interest in Uranus missions has also led mission architects to look at even lower cost Uranus missions than those described above. In addition to the New Frontiers program, NASA has Discovery missions that cost approximately half that of New Frontiers missions at <$500M. To date, none of the twelve selected missions will have flown beyond the asteroid belt. Flying to any outer solar system destination poses considerable challenges within the Discovery program cost cap. The long flight times require greater spacecraft reliability and require funding many years of flight operation costs. Missions beyond Jupiter (and some within the Jovian system) also require plutonium power supplies, although NASA in the past has offered to help defray the costs of using an ASRG system. To fit within the Discovery cost cap, a Uranus mission would be limited to a simple flyby and likely would carry only one or two instruments. The spacecraft also would need to be able to conduct science beyond what Voyager did in 1986, a tough task with just one or two instruments. Recently, though, a proposed Uranus Discovery mission has been studied that would do that with just a single instrument. To understand the proposed mission, let me give a bit of background. Gaseous worlds have internal turbulence that generates acoustic wave oscillations that propagate to their surface. (The closest equivalents in a solid rocky world are earthquakes that periodically produce movement at the surface.) Solar astronomers have exploited this phenomenon through helioseismology to study the interior “seismology” of the sun. The giant planets, including Uranus, can also be studied using the same technique. (Uranus is referred to as an ice giant because the bulk of its composition (such as water) would freeze if exposed to space that far from the sun. However, the pressure and heat within Uranus keeps the deep interior fluid except for a rocky core.) A Doppler spectrographic imaging instrument could measure the oscillations and reveal the interior structures of outer planets. To date, however, no spacecraft has carried one to an outer planet. 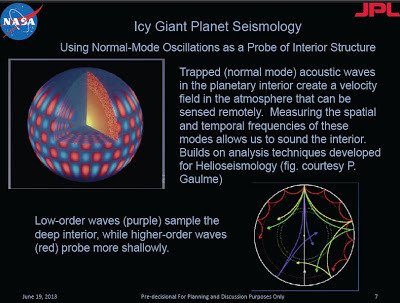 Acoustic wave seismology for giant planets including Uranus. 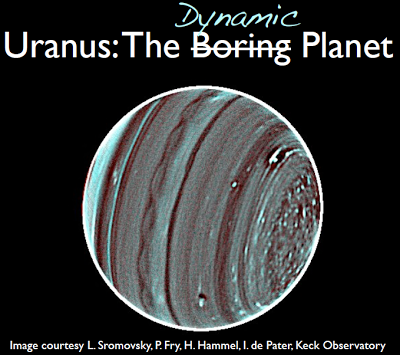 From a presentation by Steve Matousek and colleagues at JPL on the Uranus Explorer concept. A JPL team has proposed a Discovery-class mission that would carry a small, 35 cm telescope that would house both a Doppler imager and a visible camera. The spacecraft would first flyby Jupiter to study its interior. Approximately seven years later, the spacecraft would repeat those measurements at Uranus. · Determine atmospheric zonal winds and dynamics. Acoustic waves have been detected on Jupiter, but not so far for the other giant planets. It may be that their greater distance puts the detection of these waves below the measuring threshold for Earth-based telescopes. For Uranus, these waves may be especially weak. 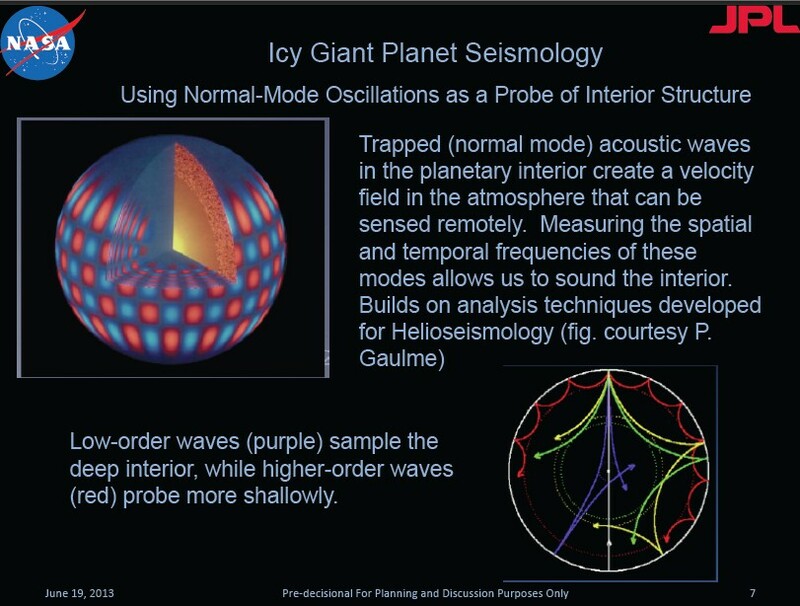 Acoustic waves are created by internal motions produced by heat flow within the planet. Key trace gases such as carbon monoxide in the upper atmosphere demonstrates that this convection occurs on planets such as Jupiter. (Carbon monoxide forms in the deep, hot interiors but chemical reactions in the cooler upper atmosphere eventually converts it to methane. For carbon monoxide to be detectable, it must be regularly replenished by convection.) Uranus, however, is unique among the giant planets in having a low heat flow and a lack of these key trace gases. If the Doppler measurements fail to measure acoustic waves at Uranus, this could put a threshold on the amount of internal convection within the planet. Determine the geology, geophysics, surface composition, and interior structure of large satellites. Determine the composition and dynamical stability of the rings and small satellites. In researching this post, I have come to realize how diverse Uranus’ moons are. Like Saturn, Uranus has many small moons in and near the ring system and a diverse group of medium-sized moons further out (see this presentation). (Uranus, of course, lacks a truly large moon equivalent to Saturn, though.) Uranus’ Ariel, like Saturn’s Dione, shows signs of internal activity that have partially resurfaced its surface. Two of Uranus’ moons are large enough that astronomers suspect that they may harbor interior oceans. The JPL presentation focuses on demonstrating that a scientifically compelling Discovery-class Uranus mission is possible. With further study, I suspect that a proposal team building on this start would find additional, fairly low cost ways to enhance the science. Careful design of the flyby trajectory could have the spacecraft travel behind the rings and allow the transit of the radio signal from the spacecraft to measure the structure of the ring system. If an ultra-stable oscillator was including in the communications system, the radio transmissions could be used to measure gravity fields. Improving on Voyager’s gravity measurements of Uranus itself would be difficult because the spacecraft would have to fly dangerously close to the top of the atmosphere where inner ring particles could present a hazard. However, the craft could be sent past one of the moons to use gravity to measure its interior. International partnerships might allow adding a simple instrument or two like this to the craft with little cost to NASA. One high priority instrument might be a visible/near-infrared mapping spectrometer that could measure trace gases in Uranus’ atmosphere. Measurements of trace gases (or their absence) would provide a second way to estimate the internal turbulence of Uranus. Alternatively, if the flyby spacecraft carried a magnetometer and its trajectory carried it close to one of the larger moons, it could look for changes in the magnetosphere that could confirm an ocean. A magnetometer also would provide a second look at Uranus’ magnetosphere. The JPL presentation describing the proposal calls the mission simply the “Uranus Explorer.” Because the spacecraft studies two very different giant planets, I think a better name might be something like, “Echoes: Giant Planet Seismology.” JPL’s Uranus Explorer Discovery mission concept is in the early stages of study. What I find exciting is that the results so far suggest that a compelling mission to Jupiter and Uranus could be possible within the tight cost constraints of the Discovery program. Editorial Thoughts: Before I did the research for this post, I had almost given up hope for a return to Uranus within my lifetime. (I’m in my mid-fifties.) Now it appears that a mission could fit within either the New Frontiers or the Discovery program, and I’m hopeful. However, I also recognize that NASA’s shrinking planetary science budget means fewer missions will be flown. Competition from other exciting solar system destinations will be fierce. But I am hopeful. As I wrote this post, I found myself wondering which of the mission options I personally find most appealing. I concluded that I believe the combination of a flyby spacecraft with the Doppler imager-camera with an atmospheric probe would provide the combination of science that I believe is most compelling. I don’t know if this could be done within the cost cap of a New Frontiers mission or not, and recognize that the scientific community may well decide that another mission configuration provides better science. For me, though, the combination of examining the interior of two planets, measuring the composition of a new class of worlds with a probe, and imaging the other half of Uranus’ moons is compelling. But I would be excited by any mission to Uranus.